Tickets can be purchased at Livenation.com, the Fox Theatre Box Office and the Little Caesars Arena XFINITY Box Office (both without service charge) and Ticketmaster.com. 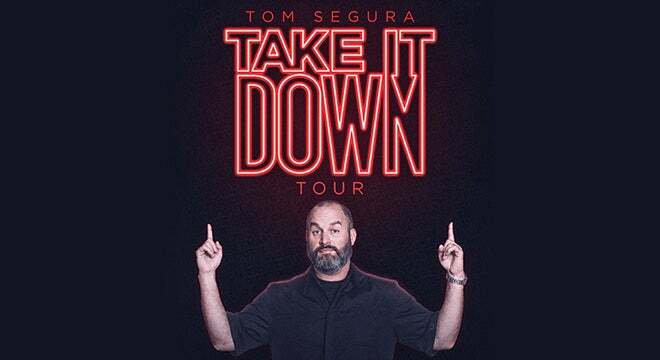 Actor, comedian and writer Tom Segura brings his 2019 “Take It Down Tour” to the Fox Theatre on Saturday, June 1, 2019 at 8 p.m.
Segura has quickly become one of Hollywood’s most in demand and highly regarded talents. He is best known for his three Netflix specials, Disgraceful (2018), Mostly Stories (2016) and Completely Normal (2014). Paste Magazine described him as, “...having a natural and capable storytelling ability, one that lifts his narratives out of average anecdote fare and plants them firmly in hilarious ground.” Additionally, his hit podcast Your Mom’s House which he co-hosts with his wife, comedian Christina Pazsitzky, was a finalist for Best Comedy Podcast at the Stitcher Awards and profiled by VICE. Segura has risen to be one of the top comedy theater acts in the country. He also continues to perform at the top comedy festivals in the world, including Montreal’s Just For Laughs Comedy Festival, The Melbourne International Comedy Festival, The Comedy Festival – Las Vegas, The South Beach Comedy Festival and The Hong Kong Comedy Festival.